A trip to Hartenbos during summer cannot be complete without a visit to the wildly entertaining Hartenbos Water park. For friends and family, nothing beats the thrill and fun of a water slide. From big to small, Hartenbos Water Park has something for everyone to enjoy. 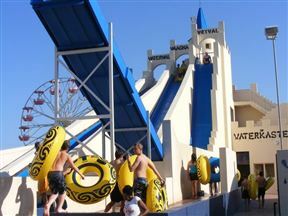 Hartenbos Water Park is 1km from the centre of Hartenbos , the nearest airport 32.5km (George Airport).